Kalimpong: The Jana Andolan Party received a jolt on Monday when one of its two councillors at Kalimpong municipality joined the Binay Tamang faction of the Gorkha Janmukti Morcha. G. O. C. Phippon, the councillor of ward 4, said he was quitting the JAP and joining the Morcha for the sake of the development of his ward. "The GTA has been talking about taking up development work in my ward. That is also my vision. 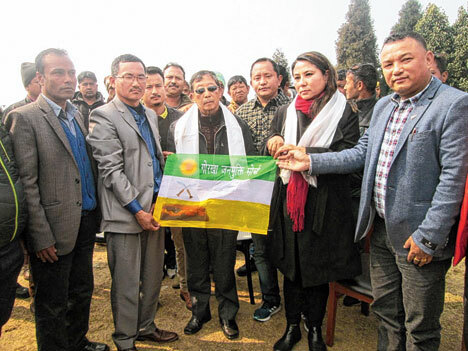 We discussed the matter in my ward and decided to take this step (join Morcha)," he told reporters here after formally joining the party in the presence of Anit Thapa, the second-in-command of the Morcha's Tamang faction. Lepcha claimed that 70 families from his ward had joined the Morcha, along with him. With his switch to the Morcha, the party's strength in the 23-member civic body has gone up to 15. While the JAP has been reduced to a single member, six others belonging to the undivided Morcha had resigned from the party and become independent councillors. Another Morcha councillor had died last year. JAP president Harka Bahadur Chhetri sought to make light of Phippon's desertion. "When someone of no consequences leaves, it does not affect us. Those who believe in the idea of separate state and the ideology of the JAP continue to remain with us, others who have joined our party for their selfish interest are leaving," he said. The JAP president also said his party would organise a discussion on Gorkhaland at the Constitutional Club of India in New Delhi on March 15. Leaders of various national and regional parties, he said, will be participating in the discussion.